Here’s a fairly extensive Q&A I did with Guy Kawasaki for Amex OPEN Forum. In it, I share some practical tips for applying my Googley Lessons to the SMB space and also take some shots at Rupert Murdoch and those new-fangled check-in social media platforms. Thank you Guy for the opportunity to “open” up a bit here! See you at the Ranch, Dude. 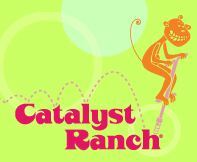 If you’ve never been to Catalyst Ranch, it’s quite the unique venue filled with all the accoutrements to satisfy your ADD. Think play-dough and pipe cleaners… ok, stop thinking about them and get back to my email! During this session (which will only go 60-90 minutes, leaving the rest for socializing), I’ll be toggling between white-board exercises, powerpoint (no more than 7 words per slide, promise!) and rapping. As you know, I’m not one for over-hyping (hah!) but I’m fixin’ to outdo the 2 minute rap I threw down at SES Chicago a few weeks ago. Here are the nitty-gritty deets. See the email below for the full pitch. And feel free to invite others. Cost: $20/person or 2 new children’s books (all proceeds & books will be donated to Open Books). Light refreshments will be served. Hope to see you there! Please register through this link. Mink does a great job of threading together insights from a number of various authors to show how social marketing “can be low cost, high reward.” I’d definitely suggest investing some time in reading through his column. The big picture idea is that any organization — regardless of size or category — can apply lessons learned from Google to better engage new and current customers. Many people think the secret to Google’s success is some complex algorithm or similar marvel of engineering. The truth is that Google just applied some tried and true marketing principles to drive usage and revenue. 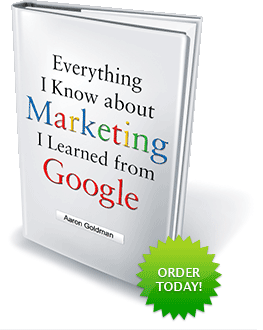 The goal of my book is to demystify Google and share the key elements of its success so that any business executive can inject a little Google juice intro his or her organization. What are [some] tips that business people can start implementing right now that will make the most difference in their marketing with respect to the information in [your] book? 1. Keep it simple, stupid. There’s nothing simpler than Google.com. There’s no ambiguity over what the product is or how to use it. How can you bring Google-like clarity to your business? One way is to perfect your Twitter Pitch. Describe your company in under 140 characters. Then shrink it to 95 characters and run it as a text ad on Google. Experiment with different versions and see what works best. 2. Be where your audience is. Google doesn’t make you go to Google.com to Google things. You can Google from your desktop, toolbar, mobile phone, and anywhere else where there’s an Internet connection. In today’s world of infinite sources of information and entertainment, it’s critical to bring your brand to your audience and not what for it to come to you. Your website should be your hub but you need spokes everywhere your audience is spending time. The first step is figuring out where your audience is. There are great tools available from the likes of comScore, Experian Hitwise, and, yes, Google (AdPlanner) to see where your target customers are on the Internet. Google is fanatic about testing. It once tested 41 different shades of blue for a toolbar. But Google doesn’t test in focus groups. It tests in live environments. There’s no better way to gauge performance. Rather than wait to go to market until you’ve got everything buttoned up, launch your product or your ad campaign as quickly as possible and use real-time customer feedback to tweak and iterate until you’ve found the right combination. The only failed test is the one that never happens. 4. Make your company a great story. Who doesn’t know the one about the 2 guys at Stanford that crashed the university’s servers with its new web crawler? Or the one about the company that gives its employees free food, massages, laundry, and transportation? Or the one about the company that uses goats to mow its lawns? Generating word of mouth requires more than just creating a great product. It requires creating a great story — nay, becoming a great story. How can you make your brand more memorable? You don’t have to reinvent yourself. Just give people something to talk about. For example, if you’re a retailer, stock your cash register with $2 bills and give people a reason to tell others about their experience in your store. 5. You can learn a lot from a query. Every day, billions of people around the world tell Google what’s on their mind. Google uses this data to deliver targeted ads to the tune of $20+ billion annually. How can you use search data to drive growth for your company? Track query volume for specific products to adjust your offering and/or features. Monitor query volume in certain geographic regions to help prioritize expansion plans. Measure query volume for your brand name to gauge the effectiveness of your other marketing efforts. When it’s all said and done, what makes the most difference and is the best use of a company’s or their executives’ time and money in the digital and social media marketing space? At the end of the day, if I had to pinpoint one reason for Google’s success, I’d say that it figured out how to be relevant. It created a product that’s highly relevant (read: indispensible) to anyone using the Internet. And it created that product based on new and innovative ways of determining relevancy based on what people are looking for and what assets are available. As a business executive, when thinking about digital marketing and social media, you must make yourself relevant. Build a brand that’s relevant to your target audience(s). And create assets that Google will deem relevant to people searching for related products and services. Getting to the top of Google is not about gaming the system. It’s about proving relevancy. If you can’t get a #1 ranking then you’re not as relevant to your audience (or the product/service being searched) as you think. Find new and innovative ways to demonstrate your relevance and Google will reward you. And so will your customers.